The other day I saw a number of anti-racist people tweeting that “nearly 90% of full-time professors are White.” As I have previously complained when 90% of the full professors at my then-school (UNC) were White, I was interested to follow up. Unfortunately, that popular tweet turns out to be a stretched description of a simple error. The facts are in this Education Department report from May, which was reported at the time by The Ed Advocate, and suddenly started going around the other day for unknown reasons. The “nearly 90%” is the Ed Advocate’s description of 84%, which is the percentage White among full-time full professors, which the original report in one place accidentally describes as just full-time professors. 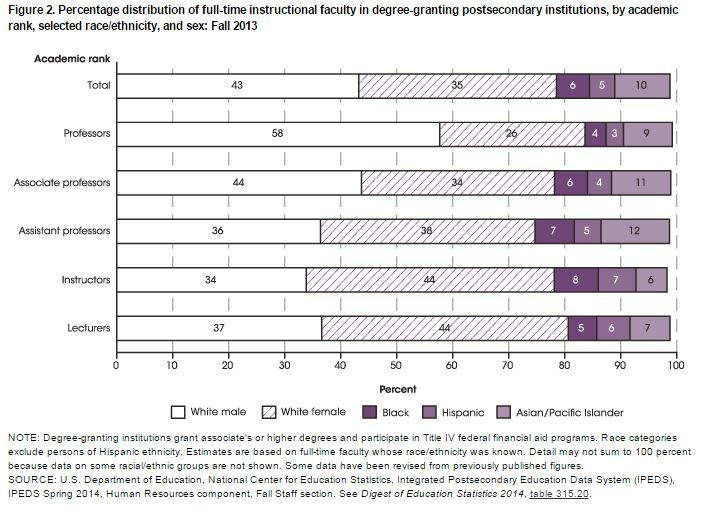 Among all full-time instructional faculty, in fact, 79% are White. So the headline, “Study: Nearly 90 Percent of Full-time Professors Are White,” was a conflation of two errors. It presumably became popular because it put a number to a real problem lots of people are aware of and looking for ways to highlight. The problem of White over-representation among college faculty is not that apparent in this national 79% statistic. 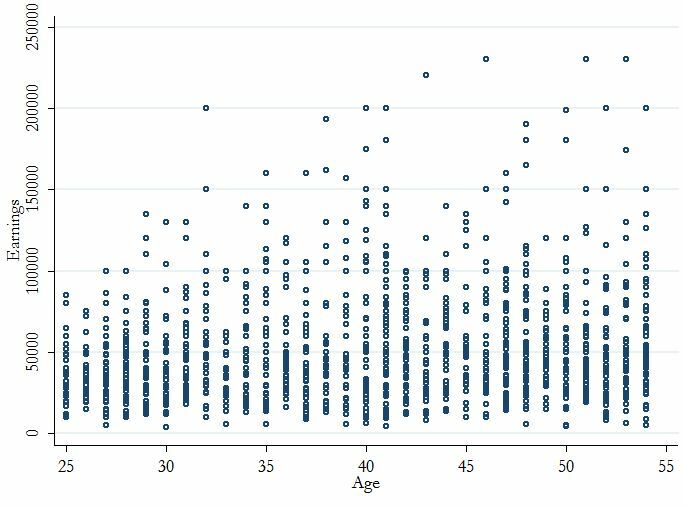 Consider, for example, that among all full-time, full-year workers age 40 and older (my made-up benchmark), 71% are non-Hispanic White. Among those with a Masters degree or higher, 77% are White. So faculty, nationally and at all levels, don’t look that different from the pool from which they’re drawn. The 84% full professor statistic reflects the greater White representation as you move up the academic hierarchy. And that’s not just a question of waiting for younger cohorts with more non-White faculty to age into the professoriate. Because the pipeline isn’t working that well, especially for Black faculty. 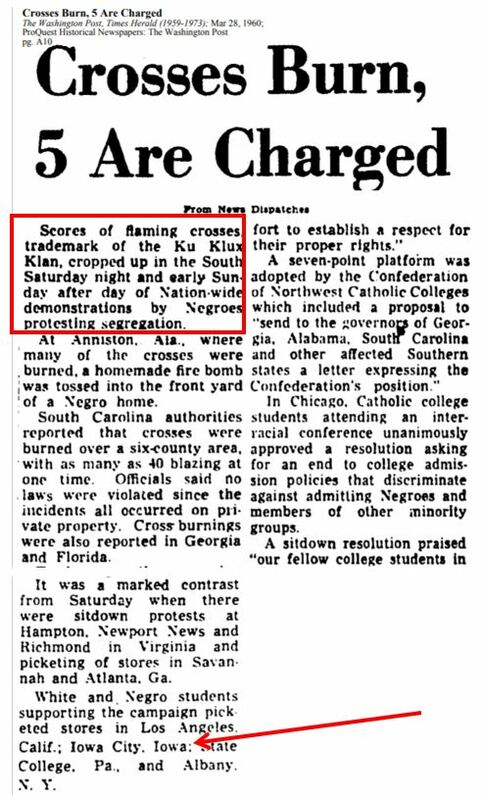 Which brings me back to my old UNC complaint, which focused mostly on Back under-representation. 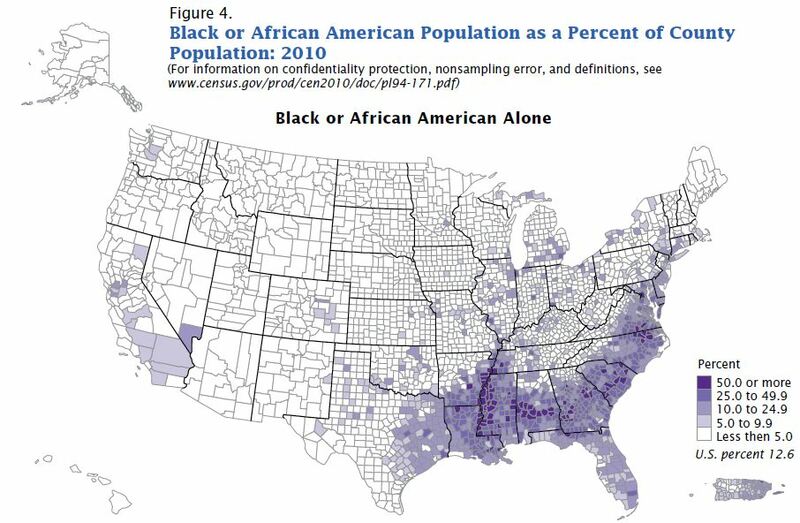 In 2010 I noted that the North Carolina population was 22% Black, while the UNC faculty was 4.7% Black. 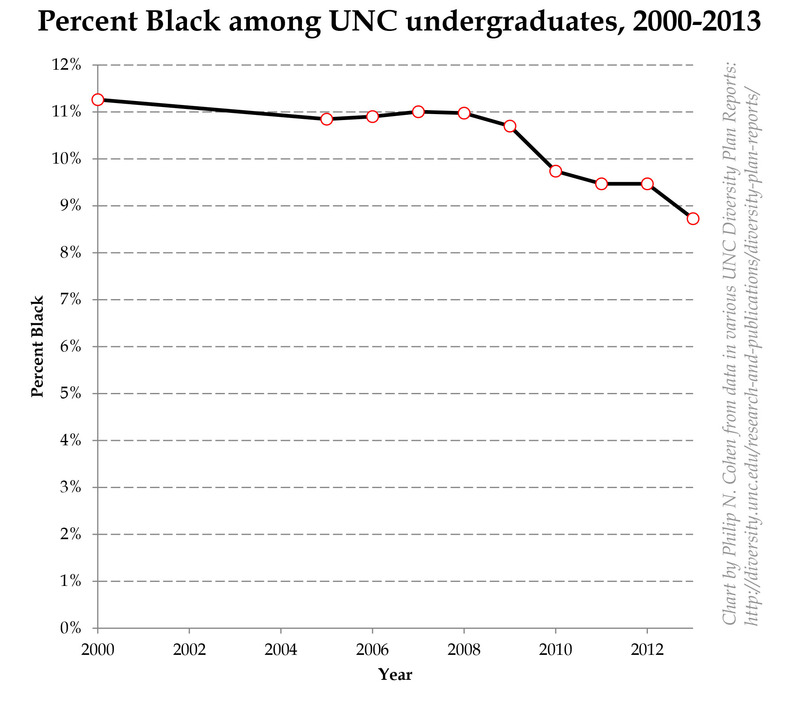 But full professors at UNC were just 2.4% Black, while the assistant professors were 7.5% Black. Is that the pipeline working? 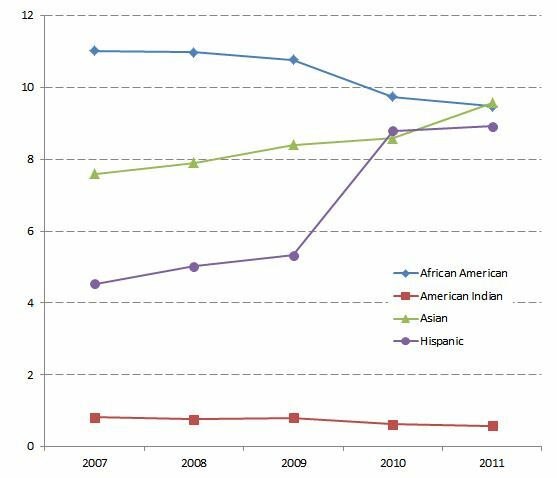 Well, only 4.5% of the recent faculty hires were Black. I went back to check on things. 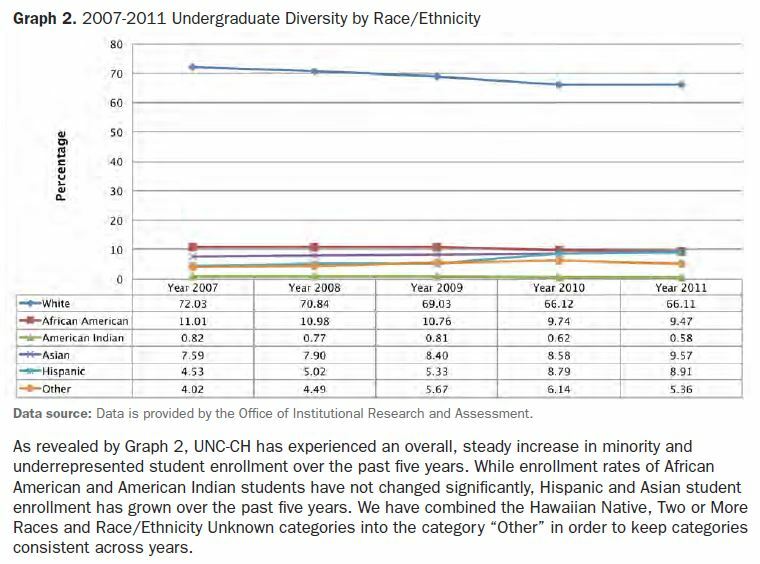 As of the 2014 report (they’re all here), the update is that UNC has stopped reporting the numbers by rank, so now all they say is that 5.2% of all faculty are Black, and they don’t report the makeup of recent hires. So take from that what you will. This is misleading: There was a big increase in Hispanic students (North Carolina has a growing Hispanic population) and Asian students, and marked drops in Black and American Indian students. But “overall, steady increase” is an easy narrative to sell. * I think I had three great Black professors at Michigan: Walter Allen, Robin D. G. Kelley, and Cecilia Green, each of whom changed my life forever. Sorry if I’m forgetting someone. Yesterday I wondered about the treatment of race in the blockbuster Chetty et al. 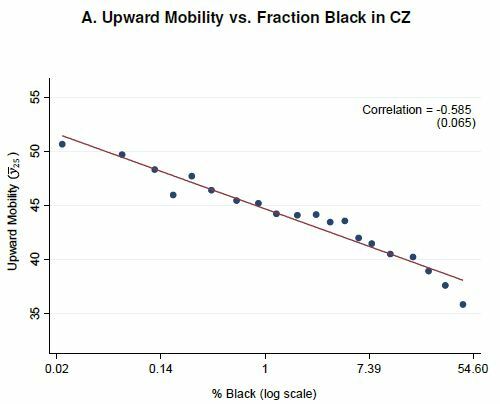 paper on economic mobility trends and variation. Today, graphics and representation. 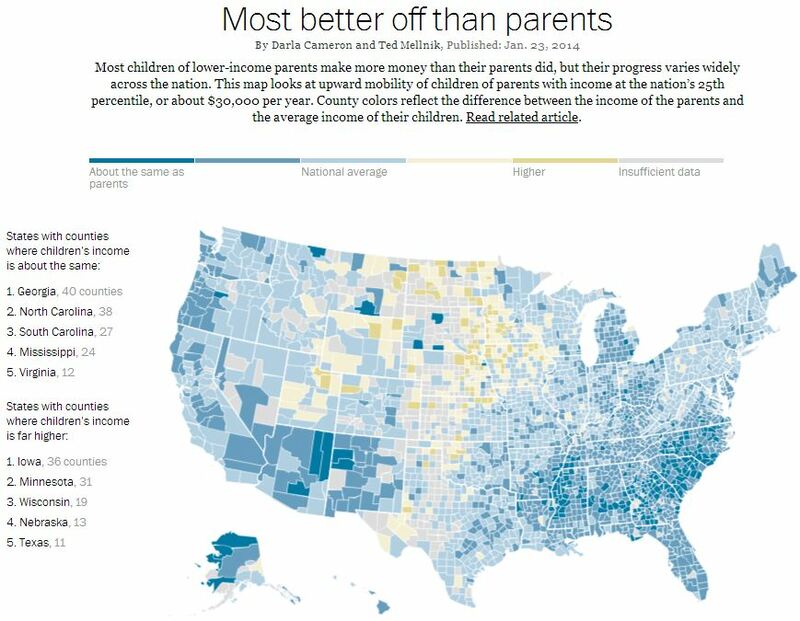 David Leonhardt tweeted that figure as “A reminder, via [Wilcox], of how important marriage is for social mobility.” But what does the figure show? Neither said anything more than what is printed on the figure. 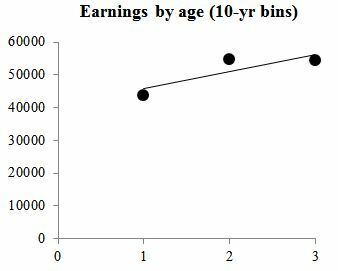 Of course, the figure is not the analysis. But it is what a lot of people remember about the analysis. But the analysis on which it is based uses 741 commuting zones (metropolitan or rural areas defined by commuting patterns). So what are those 20 dots lying so perfectly along that line? In fact, that correlation printed on the graph, -.764, is much weaker than what you see plotted on the graph. The relationship you’re looking at is -.93! 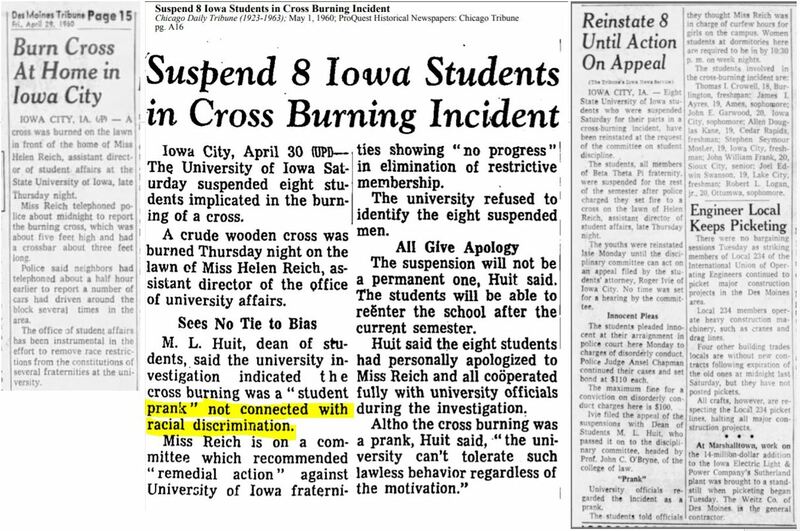 (thanks Bill Bielby for pointing that out). 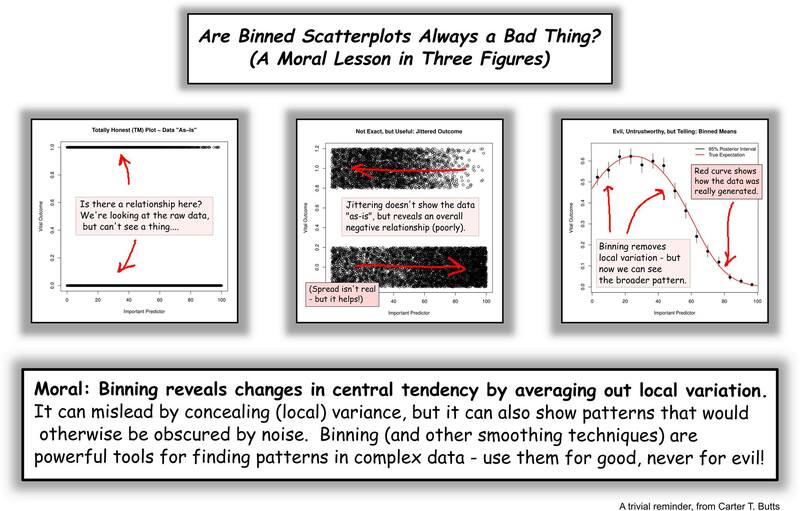 In the paper, which presumably few of the people tweeting about it read, the authors explain that these figures are “binned scatter plots.” They broke the commuting zones into equally-sized groups and plotted the means of the x and y variables. They say they did percentiles, which would be 100 dots, but this one only has 20 dots, so let’s call them vigintiles. In the process of analysis, this might be a reasonable way to eyeball a relationship and look for nonlinearities. But for presentation it’s wrong wrong wrong. * The dots compress the variation, and the line compresses it more. The dots give the misleading impression that you’re displaying the variance around the line. What, are you trying save ink? That’s 709 dots — one for each of the commuting zones for which they had sufficient data. With today’s powerful computers and high resolution screens, there is no excuse for reducing this down to 20 dots for display purposes. But wait, there’s more. What about population differences? In the 2000 Census, these 709 commuting zones ranged in population in the 2000 Census from 5,000 (Southwest Jackson, Utah) to 16,000,000 (Los Angeles). Do you want to count Southwest Jackson as much as Los Angeles in your analysis of the relationship between these variables? 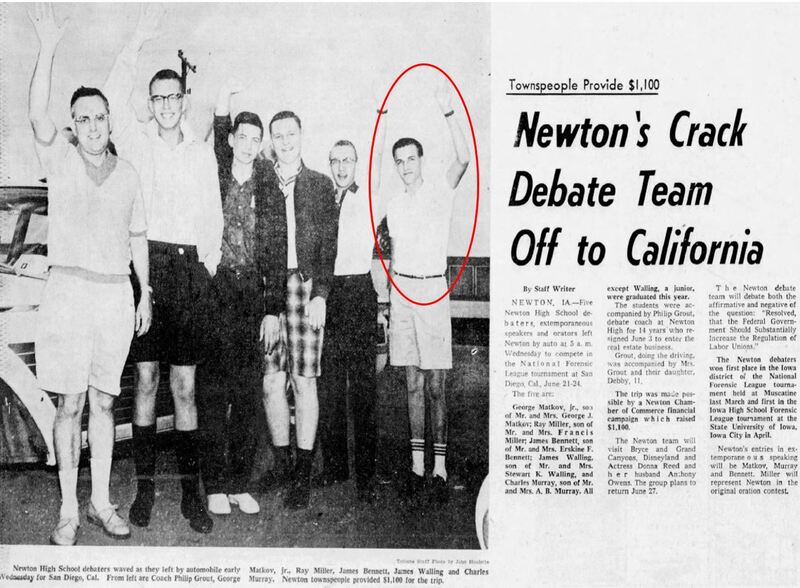 Chetty et al. do in their figure. 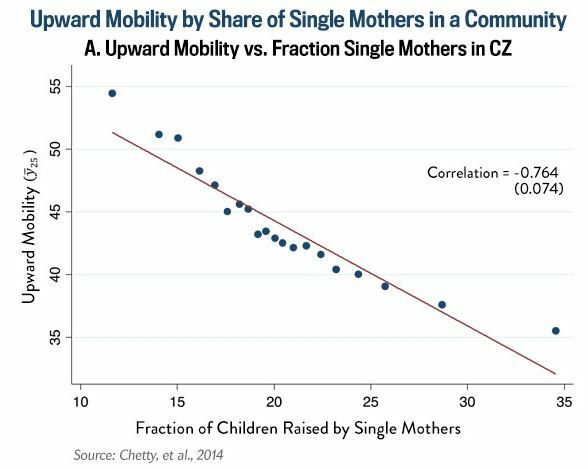 But if you weight them by population size, so each person in the population contributes equally to the relationship, that correlation that was -.76 — which they displayed as -.93 — is reduced to -.61. Yikes. Now it’s messier, and the slope is much less steep. 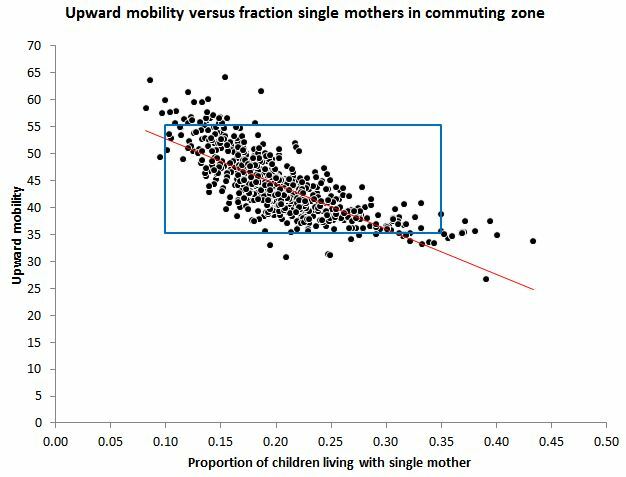 And you can see that gargantuan outlier — which turns out to be the New York commuting zone, which has 12 million people and with a lot more upward mobility than you would expect based on its family structure composition. That’s a different question. 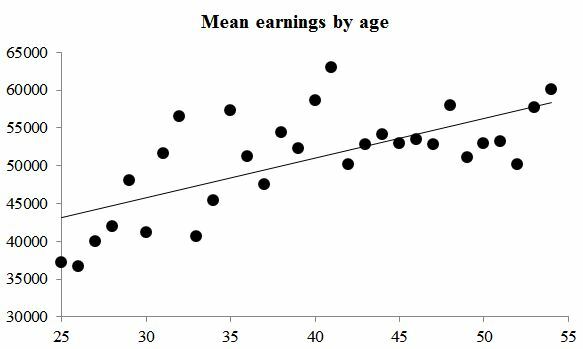 It’s not, “how does age affect earnings,” it’s, “how does age affect mean earnings.” And if you binned the women into 10-year age intervals (25-34, 35-44, 45-54), and plotted the mean wage for each group, the correlation is .86. **This paragraph was a joke that several people missed, so I’m clarifying. 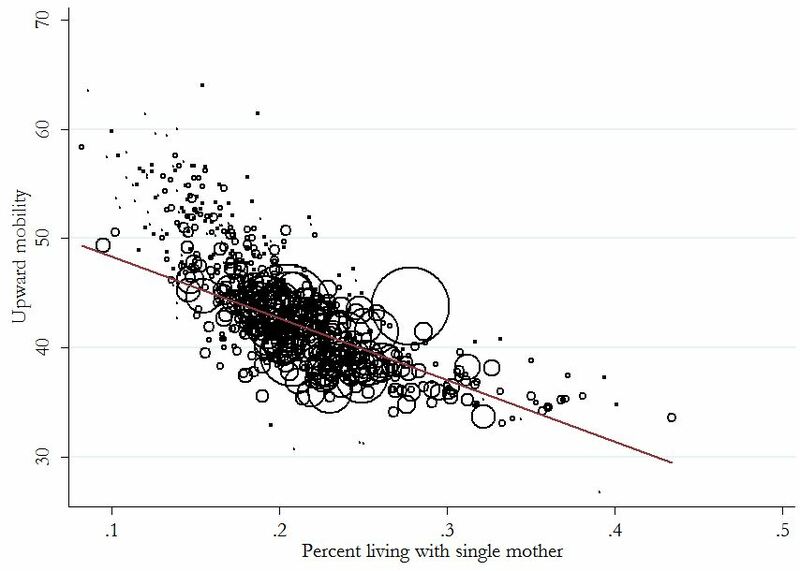 I would never draw a conclusion like that from the scraggly tale of a loose correlation like this. 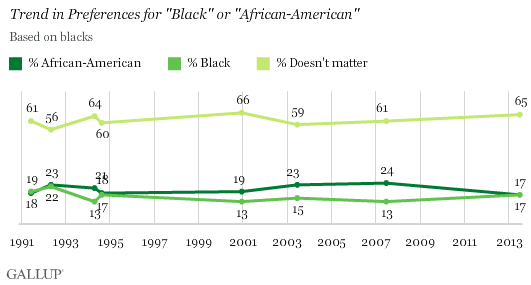 We’re pretty much back to the early 1990s, after a decade in which African American seemed like it might be pulling ahead of Black.